Business or fan pages on Facebook are becoming increasingly used by small businesses. They allow for exposure to prospective customers as well as continued communication to current clientele, so their popularity is pretty justified! If you're looking to create a fan page for your small business, your best bet is to present a polished experience for your fans (and potential fans) by designing a landing page for your profile. It’s a chance for you to tell users what you’re about, what you’re doing on Facebook, and ultimately why they should “like” you. 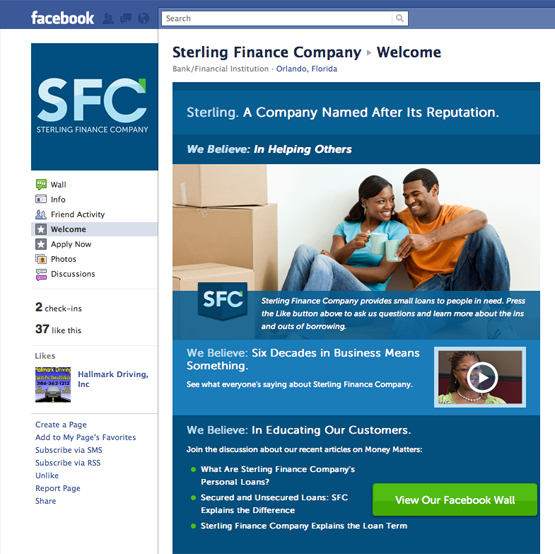 We had the pleasure of creating just such a page for our client, Sterling Finance Company. There’s no doubt that it’s valuable, but creating that page also presents you with a number of variables to decide on. This post explores several solutions via our favorite topic at COLOURlovers: Color! Before you get your hopes sky high about the customizability of fan pages, it’s important to note that you will still need to work within the basic confines of what a fan page looks like on Facebook. This is not MySpace (you remember MySpace, right? They’d let you change your profile background, adding different “skins” to allow for personalization). You'll still have the Facebook blue and white interface surrounding your page, but within the confines of your landing page, you will be the master of your color choices! Now, you could choose to just put up your business’ branded colors as they currently stand, but you'd risk clashing with the Facebook blue. Besides, if you were only interested in taking the easy way out, I imagine you wouldn’t be reading this. So, let’s look at a couple of ways to really put color choices to maximum use. There are times in life when you have to pick your battles. Making color choices in conjunction with an unmoving social media giant might be one of those times. A Facebook business page will always be accompanied by the Facebook-blue top navigation bar and Facebook-blue links. You could stand defiant and paint your entire page in your branded colors ... or you can bend creatively, playing the game to win and using Facebook’s own colors as your own. This can be risky, but it can be done if you’re willing to take that risk in a calculated fashion. My favorite example of this is the Facebook page for Victoria’s Secret. For those who weren’t aware, Victoria’s Secret’s brand colors are usually various shades of very bright pink. When tackling their Facebook page, Victoria’s Secret did a very bold thing: they barely put a shred of their well-known pink anywhere. Instead, they took the other thing they are noted for, photos of comely ladies decked in lovely lingerie, then set them in a matching monochromatic palette. And I love Victoria’s Secret for it. Rather than trying to fight against the blues already guaranteed to be present, Victoria’s Secret matched their product line to Facebook’s well-branded color. In doing this, they came out the winner. Their page fits seamlessly into Facebook while still very obviously being Victoria’s Secret. 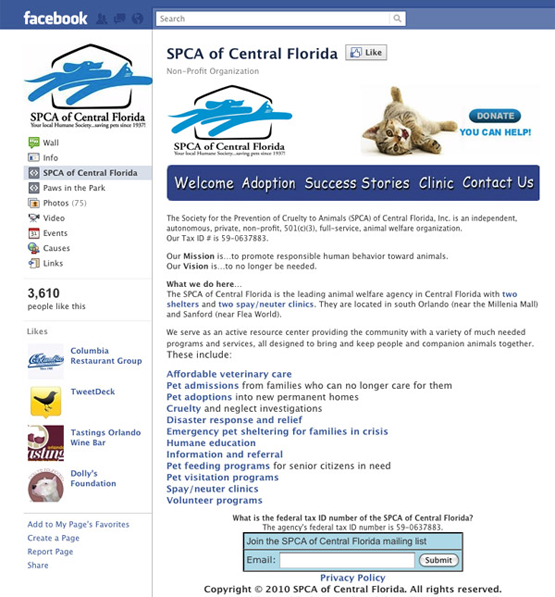 Another excellent example of utilizing a similarly-hued landing page comes to us from the SPCA of Central Florida. While they use an analogous scheme as opposed to a monochromatic scheme, the effect is the same: a page that blends right in with the pre-existing landscape. This option may not work for everyone but if you find it does, it might be worth trying. Perhaps scrapping your own brand’s colors completely isn’t something you feel comfortable with. That is understandable and completely okay. It is entirely possible to use your own company’s colors even if it doesn’t match Facebook-blue in the slightest. How? A little thing known as color schemes. Some of you may remember that we posted recently on all of the various color schemes available, making color choices for your business a little easier. The many different color schemes out there allow you to easily find colors that look good together. One great example of these color schemes comes to us from none other than Best Buy. Best Buy’s colors are quite bright together. Their logo is a saturated canary yellow with black lettering and a background hue akin to dark international klein blue. When they went to create their Facebook page, they embraced their blue and yellow colors. They kept their tag logo its bright yellow. On their Shop page on Facebook, they lightened both their blue and yellow, making use of a variation on a split-complementary scheme. Instead of completely ignoring the colors that they shared, Best Buy embraced the blues, added diversity with a lighter tint, and complemented them with shades of yellow. 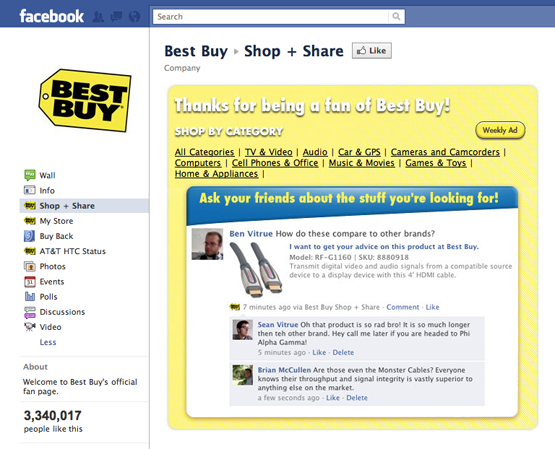 The effect is a page that looks made for Best Buy as opposed to a page on Facebook that Best Buy happens to occupy. 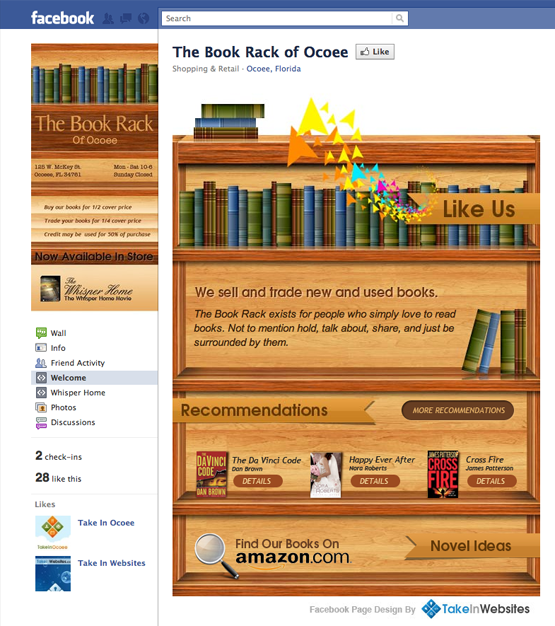 A small business example utilizing the double-complementary color scheme is The Book Rack of Ocoee. While it isn’t an exact double-complementary, it’s pretty close and they’ve even made some of the books on the shelves very close to Facebook blue. There is no reward without risk, as the saying goes. Should you decide to make some bold color choices, do your best to make sure they are wise risks. For many that will mean choosing colors that are either complementary or analogous to their business’ existing colors. If you’re struggling to find those perfect matches, some of our fellow COLOURLovers have taken a crack at different Facebook-centric palettes and for those of you who feel solid on your color choices but need help in the tech department, Mashable has a great tutorial on how to add the app to create your landing page. If you don’t want to even think about coding or technology, but still want a great landing page on the cheap, the companies listed below offer some great services for free with added payment plans for other features. Some of the features include easy-to-install facebook customization ranging from adding your twitter stream and rating tool to running contests and collecting users emails and demographics. If you know of any other helpful aids or have a great example of a beautifully matched Facebook business page, share it below. I can’t wait to see them. We’ll be doing something special for the Rise Facebook page soon and more inspiration is never a bad thing! www.rise.netStephan formed Rise in 2002, when his passion for web design hit him like a laser. Today, he oversees an eight member staff and the digital marketing for some of the area’s most prestigious clients. Stephan’s experience spans nearly two decades in all areas of design and technology. He is an untiring advocate for quality and has earned a reputation for building trust and loyalty with clients who so often become repeat clients. Today, his passion is launching sites that do more than sit: they communicate, connect and continue a conversation. Stephan lives in Baldwin Park, Florida with his girlfriend, Alison, son, Ivan and dogs, Gooch and Lexi. Stephan doesn’t believe in sweating the small stuff. I personally disliked the 'BEST BUY' one the most, but company choice of logos + colours aren't my most favourite thing in the world either. lol aww Fae! So what color combination would you make Facebook?